This new Mountain Training Rock Skills Course is a 2 day, intensive course suitable for those who have some experience of climbing outdoors, probably bottom roping or seconding, or for those who have led climbed indoors and are ready to move onto trad climbing, or for those who wish to become a more efficient and effective second. Trad climbing is a much purer form of climbing than Sport climbing in that it engages not only the body but the mind as well. You have to believe in your gear and your ability to climb the route and place the gear on lead, knowing if you fall, that your gear will hold and your belayer – your lifeline – is there for you. How to place gear efficiently and safely using only one hand. How to lead belay using single and 2 half ropes. 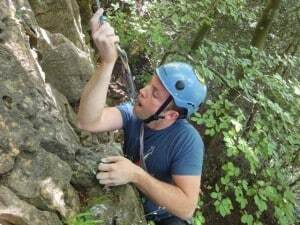 How to top rope belay safely and effectively using single and 2 half ropes. How to place and clip effective gear on the lead. How to lead trad on single ropes extending gear so ropes run smoothly. How to lead trad on 2 half ropes clipping gear to the right and left to keep both ropes in line. How to build belays on the lead. How to keep you and your second safe at all times. How to abseil and retrieve your ropes. How to manage single and half ropes and become slick and efficient. Be given advice on what gear to purchase to develop your own rack. How to maintain your gear and your ropes. There is a minimum requirement of 2 people for each course, as Ali is alongside her clients on a static rope for their first few leads in case they need help with gear placements and to help develop confidence. Venue: Wye Valley or Peak District. Cost £160 per person, minimum of 2 people, maximum of 4. Book 2 places and receive a £20 discount. Become an independent trad lead climber on this intensive 2 day course. Please state your preference for venue when booking your course. If these dates are inconvenient and you require a bespoke course don’t hesitate to contact Monsterclimbs or ring Ali 07814555378. Bed and Breakfast facilities are available for customers visiting from further afield. £25 per person or £40 2 people sharing. Details on request. A one day Refresher Trad Lead Course is available for those who are returning to climbing after a break or who wish to regain their confidence. Venue can be arranged to suit. Cost £140 for a 1:1 or £95 each for two people. Maximum of 4 people. You may initially be out of your comfort zone, but you will be safely guided throughout all the techniques and have opportunities to practice them. 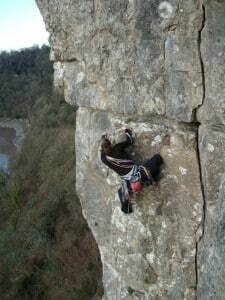 Multi -pitch climbing does tend to take place in more remote places, and does have greater potential for things to go wrong, regardless of the safety chain involved. As the British Mountaineering Council clearly states climbing is potentially life threatening and clients must be aware of the inherent risks involved. A two day course costs £200, minimum and maximum of 2 people. Courses available on request. If you are an individual enquiry you will be paired up with another client. Please complete contact form or phone Ali on 07814555378.